Any dacha site is not only a place forGardening works, but also a rest corner. And what is necessary to rest in comfort in the fresh air? Of course, a bench. To make tables and benches for a dacha by own hands is not so difficult. The main thing is desire, a little free time and fantasy. 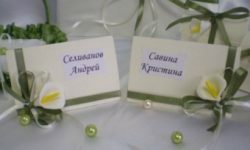 With this approach, you will be able to make original benches for the dacha and enjoy spending time on them, breathing fresh air or communicating with relatives. Of what to make a shop? First of all, determine the material fromWhich we will make a place for a smoke break. 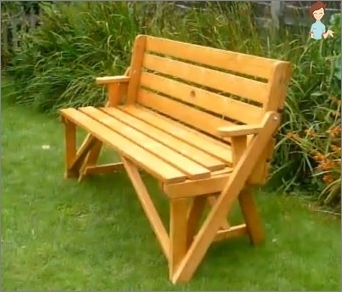 Most benches to the dacha with their own hands are made of wood. This option is the most accessible and optimal for most people. For additional protection from rain, snow and other weather conditions, wooden benches are covered with several layers of varnish. In addition to wooden, benches and tables forHousehold plots can be metal, plastic and stone. If desired, you can combine several materials at once. For example, to make a seat and a back from a tree, and armrests from metal. Such benches are famous for their strength and unlimited lifespan. 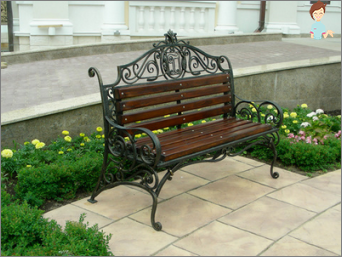 Benches for dachas, made of metal are also practical and durable. True, they have one undoubted negative - they attract, like a magnet of citizens, scrap metal. Plastic benches and tables for dachas are a very convenient option. Such furniture is lightweight, it can be moved at any time, and at the price is the most accessible. 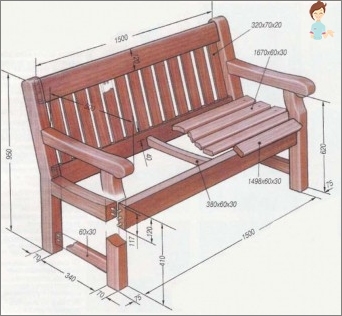 What tools are needed for making garden furniture? No expensive devices with complex names you will not need. You will completely manage the available, probably, every good owner tools: a hammer, a saw, nails, etc. Stage one is the drawing. It will help you calculate how much material you need to make a bench and / or table for a dacha. Determine how much your furniture will be, it is recommended that you do this on the spot where you plan to put the bench and table. Having calculated the dimensions: height, width and length, you can proceed to the drawing. By the way, professionals recommend to make a bench about 50-60 cm high, but if the family has children, then the shop should be manufactured below or separately, another yet smaller version of furniture should be made. If you plan to do a bench with the back, thenImmediately determine the desired height and tilt level. Those who appreciate the beautiful and decorate their furniture, it is worth considering this moment in your drawing. Forged elements must be traced in a separate sketch. If you have planned to decorate a bench with carved details, then for the sake of simplicity of work prepare a template, and on it, with the help of tools (jigsaw, hacksaw) you will cut out the elements. 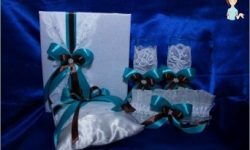 When the drawing is prepared, the materials and tools are available, you can start working. The first thing to do is a frame. Remember that the front support will be half as long as the front support. After all, the last will go into the back. For manufacturing use a solid board, without knots and cracks, this will make the furniture more durable. Then connect the two supports with a bar. As already mentioned, the optimum height of the bench is up to 60 cm, the boards for manufacturing take at least 2.5 cm, and the length - 1.5-2 m.
Now prepare the board: treat it, plan and grind the surface. Build furniture is easy and simple. The side supports are joined by boards for sitting and back. To make the product more durable at the corners are attached bars. For a more comfortable rest on the bench are madeArmrests. Bars, prepared in advance, are attached to the bench, and then the wood is impregnated with an antiseptic, covered with varnish or paint. This is done to extend the life of the furniture. If you approach the manufacture of benches with a soul and imagination, then the product will be a beautiful decoration of the infield. Forged bench from metal for a summer residence with beautifulAnd unusual ornaments will attract the attention of neighbors and passers-by. Hardly anyone can pass indifferently past such a product. The shape of furniture from metal is limited only by your imagination. With a little effort, you can create just a fairy tale. Stalls made of wood can also have absolutely any, even the most bizarre, form. Can be straight and angled. You can build a bench-bed and a trellis-shop, on which a lattice for plants will be provided. As you can see, it is not so difficult to build furniture by oneself. 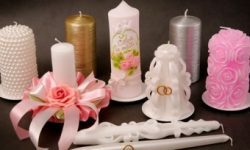 Homemade product will be a wonderful decoration of the site. At the same time it does not matter whether it is a straight or corner bench for a dacha, made of wood or metal, most importantly, it is an individual style and a part of the soul that you will invest in making furniture.